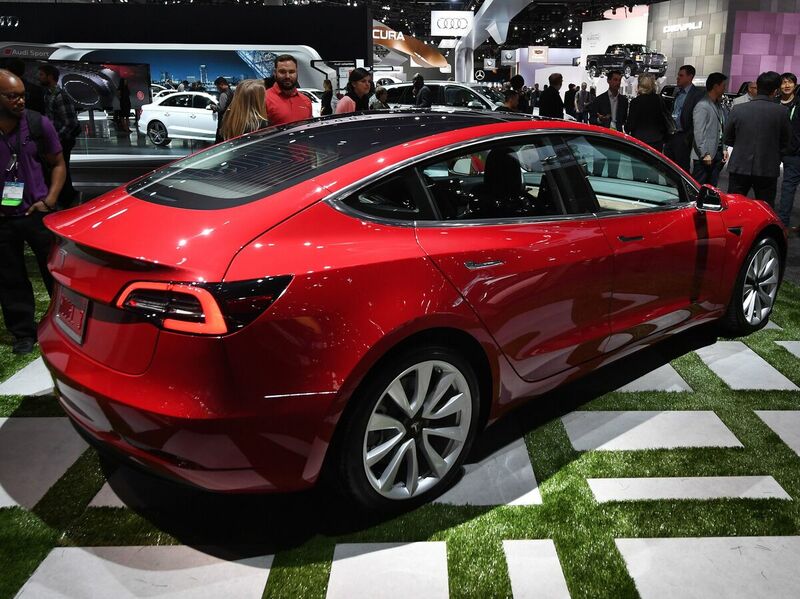 The new Tesla Model 3 is displayed at the 2017 LA Auto Show. The company has struggled to meet its goal of producing thousands of the vehicles per week. You can see how different Tesla is from the rest of the car companies at a place like the LA Auto Show. The tiny Tesla booth has only one car on display. There’s no glitz, or models leaning seductively. But it was swamped during a showing for journalists. That lone car is Tesla’s Model 3, aimed at the mass market. It’s not the only car that’s supposed to take Tesla mainstream but also bring it to profitability. But CEO Elon Musk’s company has missed its production goals, and analysts wonder whether he’s spreading himself too thin. Rebecca Lindland, a senior analyst with Kelly Blue Book who is an admitted fan of Tesla and Musk, says the company’s marketing plan is its bold vision. Musk and Tesla have innovated many aspects of making cars and batteries. And its Model S is considered one of the best cars of the century. But the Model 3, the new car Tesla is trying to build, is the company’s make-or-break product: It’s the company’s promise of an affordable electric car. Yet, the Model 3 has fallen far short of production targets, and Tesla’s battery factory has been having trouble with production. So is it possible for one man to: revolutionize the auto industry and commercial trucking, send people to Mars, create a Hyperloop and innovate the solar panel industry? He says Musk is able to take his various companies into places others just couldn’t venture. The cult of personality around Musk allows him to raise capital easily and excite investors in a way that other CEOs can’t. The ability to so quickly get money from capital markets comes with risk. “If the market ever lost just a little bit of confidence … the ability to continue to finance the operations of the organization could get a lot, lot harder,” Anwyl says. Musk predicted this summer that the Model 3 would put Tesla through “production hell.” But other car companies like Toyota, General Motors and Volkswagen don’t face such difficulties. Jeffrey Osborne, a stock analyst with Cowen, says the big automakers don’t just build cars and trucks efficiently, they build assembly lines and car plants efficiently. For Osborne, one of the analysts who’s been bearish on Tesla, now is the worst time for Tesla to be having rudimentary assembly line problems. He points to the turnover rate of top managers. Musk is “a tough guy to work for and you know it’s a company that’s going warp speed. I just wish he’d pause and pay attention to the Model 3,” Osborne says. Sens. Jeff Flake, R-Ariz., Bob Corker, R-Tenn., and Ron Johnson, R-Wisc., seen at a hearing earlier this month, held up floor action on Thursday evening over concerns about how to control the deficit if the GOP tax bill doesn’t result in strong economic growth. Senate Republicans ran into a speed bump Thursday evening in their quest to pass a tax overhaul by the weekend. Deficit hawks — including Sens. 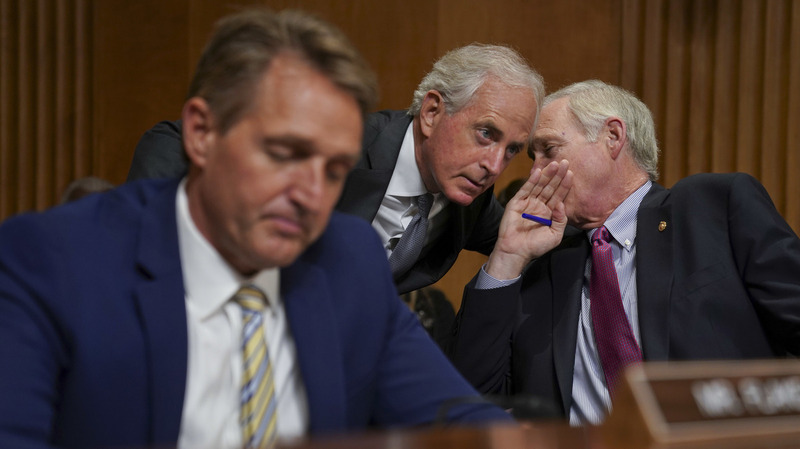 Bob Corker of Tennessee, Jeff Flake of Arizona and Ron Johnson of Wisconsin — were looking for assurances that if promised economic growth did not happen in the years after tax cuts took effect, that a trigger mechanism could roll back some tax cuts and impose some spending cuts in the future to keep the deficit under control. Sen. John Cornyn of Texas, the No. 2 Republican in the Senate, said other options were being discussed. The possibility under consideration now is fixing a date at which tax rates would increase, possibly in a gradual fashion, unless Congress acted again. But figuring out how to divide those eventual increases between the individual and corporate sides of the tax code remains uncertain. Sen. David Perdue, R-Ga., described the idea as “intense stimulus now, less intense stimulus later.” Perdue says it’s unlikely that a new package would be seen Thursday night, but he still thinks final passage is possible Friday. NPR’s Scott Detrow and Kelsey Snell contributed to this report. 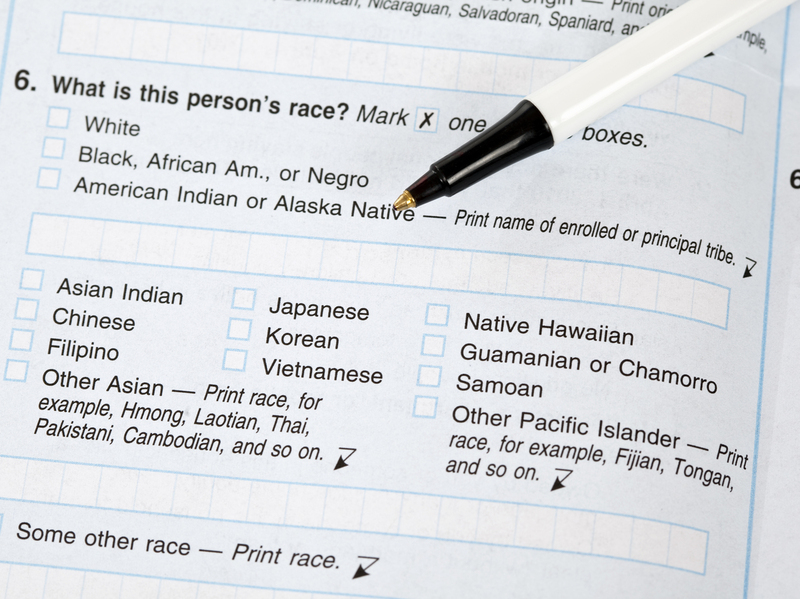 If the White House approves a proposal to change how the government collects race and ethnicity data, white people in the U.S. may be asked to check off boxes about their ethnic background. But on this 2010 Census form, answering “white” was enough to respond to the race question. “White” has been a constant of the U.S. census. Census takers determined who counted as “white” or any other race. That changed in 1960, when U.S. residents were first allowed to self-report their race. Since then, just answering “white” has been enough to respond to the race question. But the upcoming census in 2020 may ask those who identify as white to explore their family tree to share their ethnic background as well. Anyone who checks off the “white” box could also mark boxes for groups such as “German,” “Irish” and “Polish” or write in another option. That change depends partly on whether the White House approves proposals to modify how the federal government collects race and ethnicity data. They originated when President Obama was still in office, and now it’s up to the Trump administration to approve or reject them. If approved, the Census Bureau may move forward with this new way of asking people of all races about their identities on the 2020 questionnaire. Friday is the deadline for the White House’s Office of Management and Budget, which sets standards for this kind of data for all federal agencies, to announce its decisions on the proposals. Any policy changes would come at a time of heightened awareness of white nationalist calls against multiculturalism and growing partisan divides over issues about race in the U.S. Asking white people about their ethnic background is not a new concept for the census. Recent census forms, including the questionnaire used in 2010, have asked all recipients about their ethnicity specifically in terms of “Hispanic, Latino, or Spanish origin.” A question about a person’s ancestry or ethnic origin was first included in the 1980 Census and remained on some forms as recently as 2000. Past forms have asked for a person’s place of birth, the countries where a person’s mother and father were born and languages spoken other than English. “The ethnicity component for whites is pretty much meaningless now for people that have been in the U.S. for so long their ethnicity is so diluted,” says Charles Gallagher, a sociologist at La Salle University in Philadelphia who studies whiteness. Gallagher adds that some white people from families with long histories in the U.S. may connect with a “dime-store ethnicity” — an identity they can pick and choose to emphasize from their family trees. It allows white people, he says, to connect with the American immigration story without much, if any, social cost. “At one time if you’re Italian or if you’re Irish in the U.S., it meant quite a bit in terms of having access to resources. That is just no longer the case,” he says. “This was done basically through a lens of multiculturalism that allowed whites to embrace their own ancestry, as well as other groups doing the same thing. How it could get used in this climate, I think, is a little different,” says Gallagher. “We see some folks as whiter than others as it were. And so that’s, I think, a potential issue that we could see develop if we start breaking it down even further,” says Blastenbrei, who works as an operations manager for what he describes as progressive political campaigns. Still, if ethnicities are added under “white” on the 2020 Census, Blastenbrei says he would consider checking off multiple boxes. “A lot of people assume by looking at my last name that I’m probably German, but I come from so many different backgrounds,” he says, citing ancestors from other European countries including Luxembourg, France and Poland. “That is a throwback to the early 20th century when educated Americans and non-educated Americans thought there was more than one white race,” she says, referring to days when skull measurements were used to determine racial superiority among white people. Painter does not approve of the government asking white people about their ethnic backgrounds in 2020. The state of white identity today, she adds, is “utter confusion,” largely undefined between two poles of being white – either sharing the extremist views of white nationalists or not having a race in order to be an individual instead. “Given that white identity operates most easily in the shadows, that is to say it’s not queried, I think bringing it out and asking people to dwell on it is a bad idea,” Painter says. “I would rather be named and visible in all of my diversity,” says Brodkin, who says she would check off the “white” box and write in “Jewish” on her census form in 2020. House Speaker Paul Ryan, R-Wis., says that the rash of sexual harassment and sexual assault allegations coming to light could end up being a “watershed moment” in changing the culture — including on Capitol Hill — that has covered them up far too long. Meanwhile Republicans are continuing to grapple with Alabama GOP Senate nominee Roy Moore, who has been accused by multiple women of sexual assault when they were teens and he was in his 30s. Several women say he pursued them romantically, and one woman said he had sexually assaulted her when she was 14. Moore has denied the allegations, but Ryan, Senate Majority Leader Mitch McConnell, R-Ky., and other top Republicans have called on him to step aside. Moore has resisted. The White House has said that if the allegations are true, Moore should step aside, but President Trump has not gone as far as others in pushing Moore to leave the race. Trump in recent days has pressed the importance of not losing the seat to a Democrat. All those allegations are in addition to women coming forward with stories of sexual assault against high-profile Hollywood moguls such as Harvey Weinstein and journalists like NBC’s Matt Lauer, CBS’s Charlie Rose and top NPR executives as well. Ryan told NPR that, as a father, the issue is a personal one for him as he’s watched the swirl of scandal over the past few weeks. “I want my daughter to grow up in a country—she’s 15 years old—where she is empowered and respected. Wherever she goes, wherever she works, and whatever she does. And I think nowhere should that be more obvious and apparent than working here on Capitol Hill,” Ryan said. Steve Inskeep’s interview with Speaker Paul Ryan will air on Morning Edition on Friday. Since Fleetwood Mac released its debut album nearly 50 years ago, there have been many incarnations, comings and goings, couplings and uncouplings. But here’s a new combination — Lindsey Buckingham and Christine McVie have released a record together! Lindsey and Christine are my guests today. 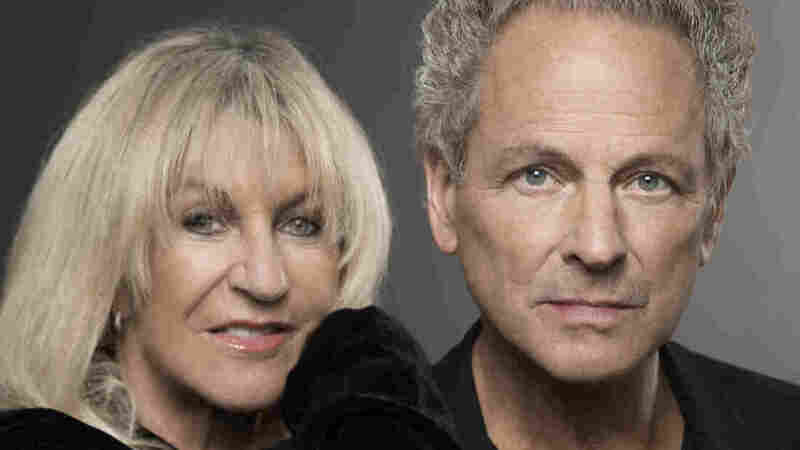 They started working on their self-titled duets record shortly after Christine rejoined Fleetwood Mac in 2014 — she had left the band 16 years before. We talk about what she was up to in the meantime, and how Mick Fleetwood helped Christine overcome her severe fear of flying. Through it all, there was never drama or ill will between Lindsey and Christine — which is maybe why their songwriting and musical chemistry is still intact after all these years. We’ll find out. But we start with a live performance of the song “Red Sun,” recorded at the Sands Bethlehem Event Center in Bethlehem, Penn. Listen in the player above. 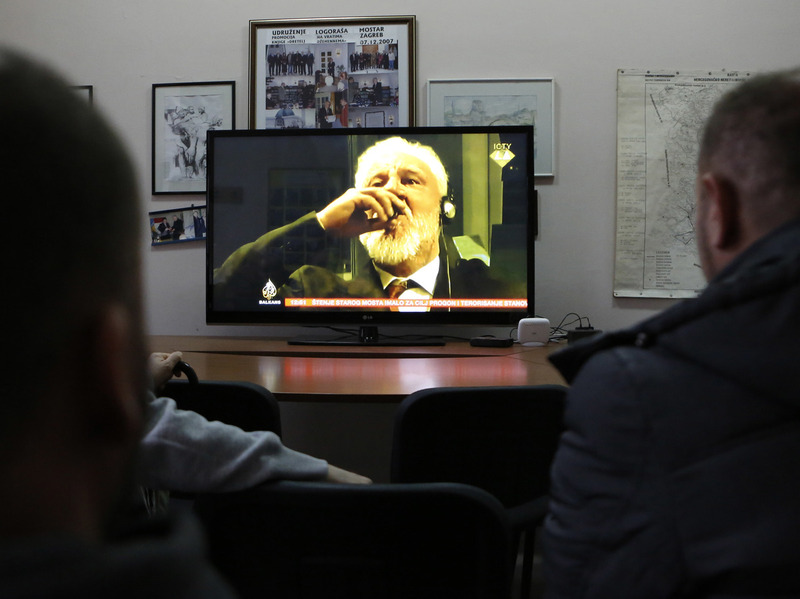 Bosnian viewers watch as Slobodan Praljak brings a small glass of liquid to his lips at the International Criminal Tribunal for the former Yugoslavia on Wednesday. Praljak, who had just had his 20-year sentence for war crimes upheld, ingested the liquid and declared “I have just drunk poison.” He died just hours later. It happened in the span of a few confused minutes. Moments after hearing that his 20-year sentence for war crimes had been upheld, Slobodan Praljak defied the admonitions of his judges, declared his innocence a final time — and with eyes wide, as if shocked himself at what he was doing, put a tiny glass to his lips and gulped deeply. “I just drank poison,” he exclaimed after lowering the glass. And the presiding judge asked for the curtains to be closed. The end came quickly. Praljak died within hours Wednesday. But as Dutch authorities open their investigation into the incident at the international criminal tribunal for the former Yugoslavia, one difficult question promises to persist much longer: How exactly did the former Bosnian Croat general manage to commit suicide in a high-security courtroom in The Hague, Netherlands, and in front of viewers streaming the video live around the world? There is reason — besides his swift death — to believe Praljak’s declaration that he had indeed taken poison. “There was a preliminary test of the substance in the container and all I can say for now is that there was a chemical substance in that container that can cause death,” Dutch prosecutor Marilyn Fikenscher told The Associated Press. That said, the official cause of death will have to wait until an autopsy is completed. 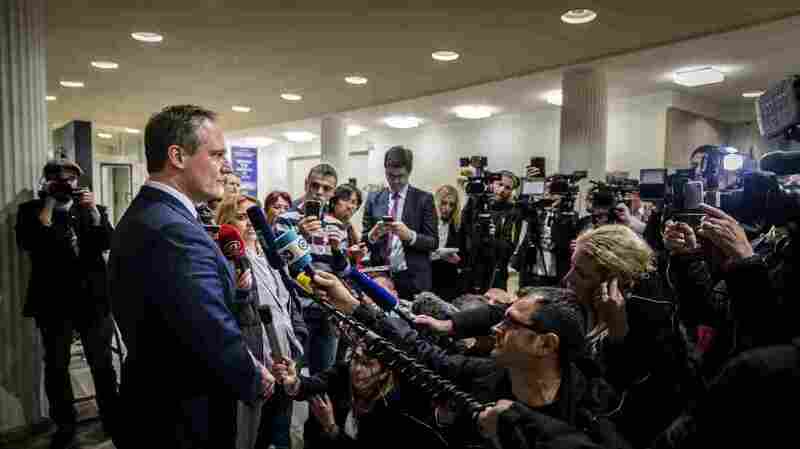 Nenad Golcevski, spokesperson for the International Criminal Tribunal for the former Yugoslavia, addresses the media Wednesday at The Hague, Netherlands, hours after Slobodan Praljak declared his innocence and apparently consumed poison in the courtroom. Still, it remains unclear how Praljak managed to acquire that substance and smuggle the vial into the courtroom. “Anyone could have brought him a bottle of poison easily,” Croatian lawyer Goran Mikuličić told CNN’s local Balkans affiliate. Defendants such as Praljak were not barred from receiving visitors or medications under the supervision of medical professionals. In fact, “everyone I spoke with, including attorneys who’ve worked at the court, were shocked not so much actually that he could have sneaked this in because it was very small,” reporter Teri Schultz told All Things Considered. “You’re checked for electronics. You’re checked for things in your pockets. But [the vial] could’ve gotten through. Similar incidents have happened at the tribunal. Slavko Dokmanovic, who who stood accused of crimes against humanity for the massacre of hundreds of civilian Croats and other non-Serbs in 1991, hanged himself in his cell while awaiting his verdict in 1998. Less than a decade later, Milan Babić also took his own life while in detention in 2006, having already pleaded guilty to war crimes for his role in the ethnic cleansing of non-Serbs in the early ’90s. In a photo taken in 1991, Slobodan Praljak poses holding a hand grenade near the front line of the violence in Sunja, Croatia. Praljak, for his part, had been sentenced to prison along with five other men in 2013. 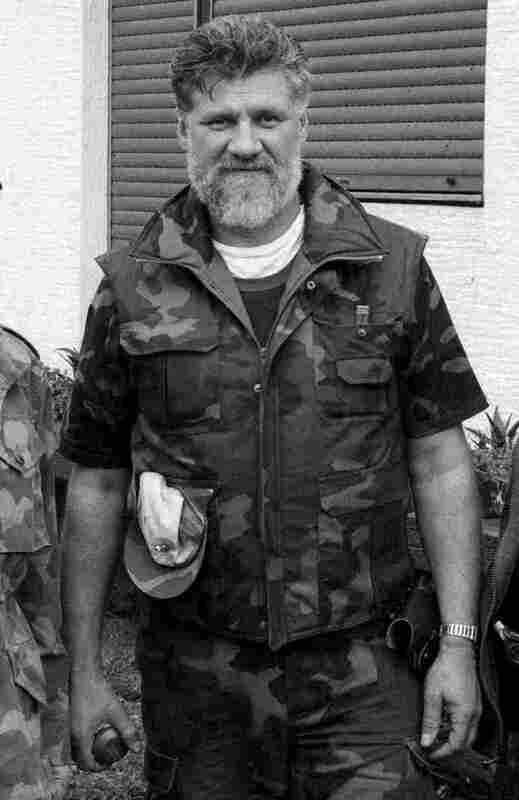 A former politician-turned-commander, he was found guilty of crimes similar to those committed by Babić and Dokmanovic — only with a different end: The tribunal found that Praljak had participated in the ethnic cleansing of Muslims in Bosnia and Herzegovina in and around 1993, a campaign of murder aimed at removing non-Croats from parts of the region. Many Croats, including those at the highest levels of the country’s government, have vehemently objected to the court’s decision to uphold Praljak’s sentence. “His act, which we regrettably saw today, mostly speaks about a deep moral injustice towards six Croats from Bosnia and the Croatian people,” Croatian Prime Minister Andrej Plenkovic said Wednesday, according to Reuters. 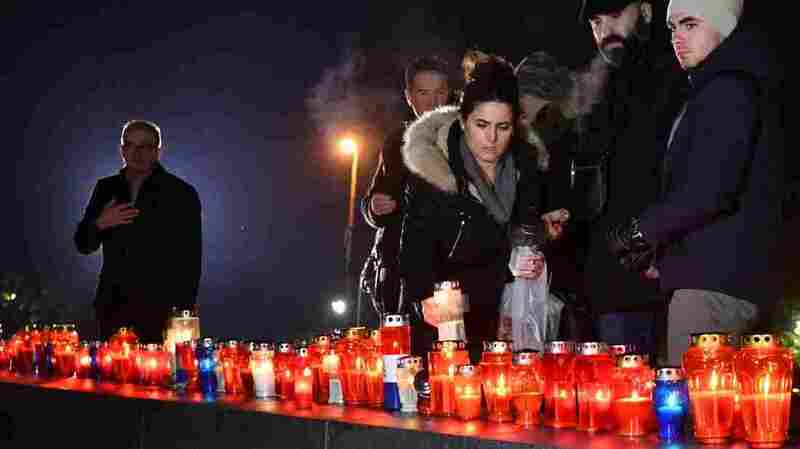 Residents of the Bosnian city of Mostar light candles Wednesday night in tribute to convicted war criminal Slobodan Praljak. But the response to Praljak’s death was far from unanimous in Croatia. An FDA report warns dog owners of the dangers of “bone treats,” which are often cooked or dried and made with flavoring and preservatives. The FDA released a report this month that warns against giving dogs what they refer to as “bone treats.” The report contrasts these treats to uncooked butcher bones. The treats are processed and packaged for sale in groceries, pet stores and online retailers. Multiple companies produce these products marketed with names like Meaty Beef Knuckle Treat, Beef Femur, Ham Bone. Carmela Stamper with the Center for Veterinary Medicine at the FDA said in the report that things can get serious quickly. 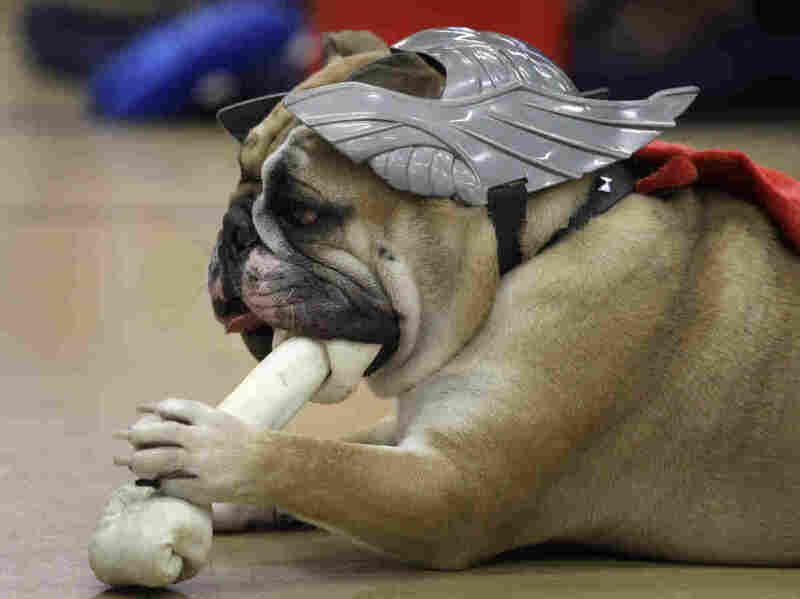 “Giving your dog a bone treat might lead to an unexpected trip to your veterinarian, a possible emergency surgery, or even death for your pet,” she stated in the report. Chicken bones and other bones from the kitchen table can cause injury when chewed by pets too. So be careful to keep platters out of reach when you’re cooking or the family is eating. Dr. Christine Bryan is a professor of community veterinary services at Mississippi State University. She tells NPR she’s seen a lot of canine patients suffering ill effects after consuming bone treats. As a veterinarian, Bryan never recommends bone treats. She says one of the issues with them is the way that some are made. Instead of being an actual animal bone, some products are animal material ground up and pressed into a bone shape. This increases the risk that small shards of the treat could break off and cause internal damage or blockages, Bryan said. She wasn’t surprised to read about the FDA’s recommendation. She said it’s fairly widely known that bone treats are not good for dogs, but owners give in out of a sense of love. They want to spoil their dogs, and they don’t realize the danger, Bryan said. And sometimes it’s a matter of cost. At some stores, a bag of 15 bone treats is less expensive than one synthetic bone or a new chew toy. “I think people think that it’s never going to be their animal that’s affected by it,” Bryan said. As an alternative, Bryan likes chew toys that engage a dog’s physical and mental energy. Bryan recommends a type of rubber toy with holes that owners can fill with peanut butter or canned dog food and freeze for longer play time. She also suggests a synthetic chewing bone that’s appropriate for the dog’s chewing strength. Above all, Bryan echoes Stamper’s recommendation to supervise dogs when they have any sort of chew toy or treat. Holiday time often results in higher instances of dog digestive distress. Holiday parties with large spreads are easy targets for sneaky dogs, Bryan said. When in doubt, contact your vet. “We are here, and we want to help our patients be happy and be safe and try to avoid these problems in the first place,” she said. One of the nation’s oldest holiday celebrations takes place Thursday evening on the Ellipse next to White House — the annual lighting of the National Christmas Tree. It is a tradition that dates back to the Coolidge administration in the 1920s and this will be President Trump’s and first lady Melania Trump’s first time taking part in the event since moving into the White House. Here’s a closer look at the president’s claim. While it is still unclear if congressional Republicans can deliver that tax overhaul Trump is so eager to sign into law, checking to see if “Merry Christmas” actually left presidential vernacular is a bit easier to answer. 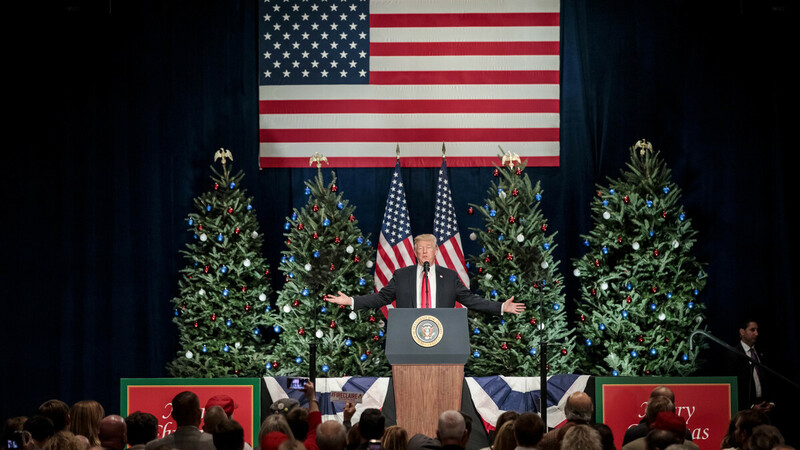 Todd Starnes of Fox News earlier this week penned an article thanking Trump for bringing “Merry Christmas” back to the White House. As one journalist pointed out on social media this week, the Obama administration said “Merry Christmas” annually for eight years. Well, perhaps Trump was suggesting the George W. Bush administration did not say “Merry Christmas”? Nope, that administration did so too, including in 2008 when former President Bush spoke to U.S. troops stationed in Iraq. So the reality is, as best we can tell, “Merry Christmas” never left the White House. Fate, in the Woody Allen sense, is when human error and circumstance join forces to make your life miserable. So maybe there’s something fateful in the fact that Wonder Wheel, his first movie in a decade to get a holiday release, happens to be coming out during a winter of extreme discontent in entertainment, thanks to revelations of men who have for decades abused their positions of power to harass and harm women. One of the key reporters behind those revelations? Allen’s estranged son, Ronan Farrow; the reasons for their estrangement are well-documented and hardly worth re-litigating here. Suffice it to say that a line in this movie about a father treating his daughter like his girlfriend won’t go unnoticed. And Allen must be a winner of history, because his latter-day films are almost all ahistorical. Even when they are purportedly about a real moment in time, as is the case with Wonder Wheel and his previous film Café Society, they aren’t focused on the period so much as a wispy idea of what that time represented to Woody Allen. This movie doesn’t even bother to define the year in which its Coney Island-set melodrama takes place, beyond noting it’s the “1950s.” But the real 1950s were too messy for an Allen film to deal with truthfully, anyway, so it’s better for him that we already understand his movies take place in Woodyland, a funhouse version of reality not unlike Coney Island itself. And like the real Coney Island, the paint in Woodyland is chipping and the luster is vanishing. Wonder Wheel isn’t merely a bad movie but a laughable one. Allen’s scripts were never realistic, but here every character is a self-parody with a straight face, saying ridiculous things like “I know where the bodies are buried,” “I went to the school of hard knocks” and “The dramatist in me sensed she must be in some kind of trouble”. When they aren’t marble-mouthing their way through this stuff, they’re working themselves into a fever gushing about Eugene O’Neill, as though Allen hopes that invoking the spirit of one of history’s greatest dramatists will elevate the film in the same way that summoning the ghost of Tennessee Williams did for Blue Jasmine. It doesn’t. 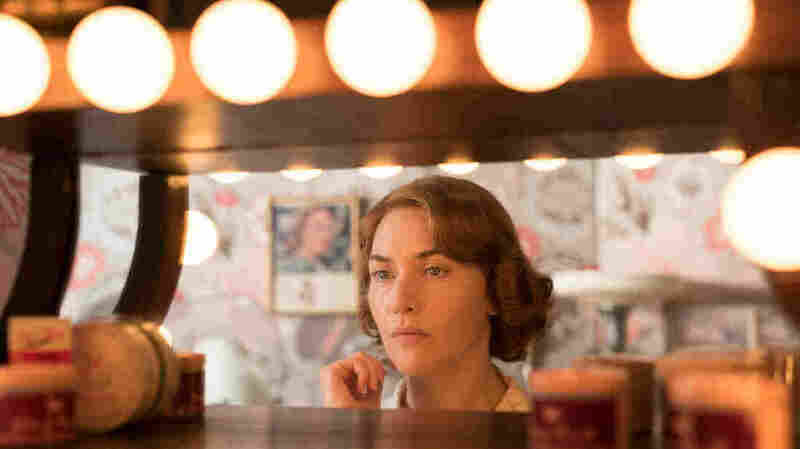 The film’s would-be saving grace is Kate Winslet, who hyperventilates trying to pretend she is embodying a real character being pulverized by fate, instead of a Woodyland creation devoid of agency who’s being pulverized by a weak script. Winslet plays Ginny, an unhappily married 40-year-old waitress who lives inside fantasies of her youth in the theater, shades of The Purple Rose of Cairo. Her permanently oil-stained second husband Humpty (Jim Belushi in full fuhgeddaboudit mode) repairs the boardwalk’s merry-go-round and is shocked anew every time she tells him she doesn’t want to go fishing or see a baseball game. Her son from a previous marriage (Jack Gore) is a pyromaniac, because it lets the film cut away to him starting a fire as a convenient metaphor. In the opening scene, Humpty’s beady-eyed, estranged daughter Carolina (Juno Temple, in a series of cleavage-baring summer dresses) comes begging to stay in their rickety yet spacious boardwalk apartment: she’s on the run from her mobster ex-husband and needs a place to lie low until things blow over. Soon, in Ginny’s eyes, everything that goes wrong in her life will be Carolina’s fault. We’re basically sleepwalking through Woodyland by this point. But it all might have been a pleasant slumber were it not for this movie’s requisite intellectual, a smarmy lifeguard named Mickey and played by Justin Timberlake in a mind-bogglingly awful performance/part mashup that’s like O’Neill read by Tommy Wiseau. Sure, it may not entirely be Timberlake’s fault that his Leave it to Baywatch beach bum is also an aspiring playwright who drones on about “the romantic narrative of the writer’s life.” But the multi-talented heartthrob has never looked more lost than when he’s trying to slather conflicted feelings for two women in a thick coating of gee-whiz mid-century smiles. Mickey’s having an affair with Ginny, who’s pegged him as her ticket out of a miserable life, until he throws everything into chaos by falling for the sweetly naive Carolina (the woman’s non-biological daughter, hint hint). You see, Mickey is a lifeguard who endangers lives, and that’s about the level of irony we’re operating on. It’s possible that Allen is using Mickey’s frequent monologues to knowingly embrace drama-student clichés instead of falling back on them, but the film (which turns on a particularly rusty screw) isn’t self-aware enough to make that distinction. Forty years ago, Joan Didion called Allen’s characters “clever children… acting out a yearbook fantasy of adult life,” and today that sense of unreality both saves and dooms his art. Saves, because it lets Wonder Wheel look gorgeous on its own merits, decorated with lush, red-purple-blue lensing (by cinematographer Vittorio Storaro) and lovingly detailed boardwalk production design (by Santo Loquasto and Regina Graves). Yet dooms, because all that pretty stuff sits there indifferent to us, to its creator’s behavior, to the world: a piece of anti-wonder. His next movie will be out next year, and then we can do this all over again. L to R: Khaled (Sherwan Haji), Mazdak (Simon Al-Bazoon) and Waldemar (Sakari Kuosmanen) in The Other Side of Hope. Arriving in supposedly liberal Europe, a refugee is hounded by the authorities but saved by a handful of scruffy outsiders. 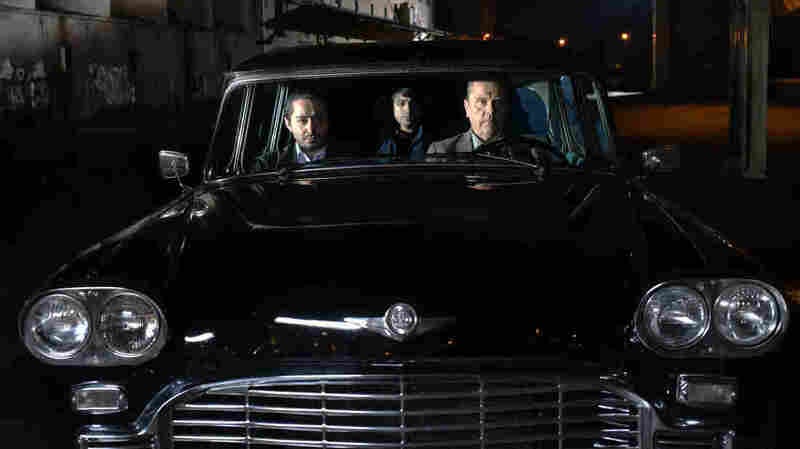 If the scenario of Aki Kaurismaki’s The Other Side of Hope sounds familiar, that might be because it’s essentially the same as the plot of its predecessor, 2011’s Le Havre. The principal distinction is that the Finnish writer-director’s latest comic melodrama is darker and more directly tied to current events. Le Havre was set in a country constructed largely from fragments of classic French cinema. The Other Side of Hope returns to Helsinki and Kaurismaki’s usual retro haunts: the docks, the streets, shabby restaurants, and any place Finnish hipsters perform their takes on American roots music. Both films have a similar tone: simultaneously bemused and outraged, detached and engaged. As always, Kaurismaki draws from mid-20th-century film noir and “women’s pictures,” sublimating their agonies and ecstasies into a sort of deadpan minimalism. Sets and shots are deliberately simple, but heightened by lots of music (sometimes amusingly incongruous) and theatrical lighting. The filmmaker’s universe is both deeply ordinary and just a little uncanny. In an unusual move for him, Kaurismaki keeps the two principal characters apart for much of the tale. Syrian emigrant Khaled (Sherwan Haji) quickly materializes, digging himself out of the coal bin in which he hid on his ship journey from Poland. Next enters Waldemar (Sakari Kuosmanen), grim and purposeful as he abandons his wife and sets out to switch careers from shirt salesman to restaurateur. Khaled applies for asylum (in English, one of the movie’s three languages). Waldemar sells his inventory and heads to a high-stakes poker game to win enough Euros to purchase a restaurant called the Golden Pint. After Khaled’s bid is denied, he escapes from the detention center, tangles with three members of the Nazi-like Liberation Army of Finland, and takes refuge behind the trash cans of a nondescript eatery. It’s the Golden Pint. Waldemar gives Khaled a job, in part because he’s a nicer guy than we’ve previously had any occasion to notice. Also, the restaurant owner and his three eccentric employees are just naturally seditious. When a health department team arrives for a surprise inspection, Khaled is not the only thing the crew rushes to conceal. They also hide the restaurant’s dog and its ashtrays. Apparently the smoking that’s routine for the Golden Pint’s regulars is against the rules. This development, unmentioned in a single line of dialogue, exemplifies the filmmaker’s brand of rebellion. One unusually direct moment underscores Khaled’s plight with TV-news footage of the carnage in Aleppo, his hometown. But most of the film’s defiance is directed toward change. Cigarettes, rockabilly, and mannered old-Hollywood movies are not simply Kaurismaki’s passions. They’re the planks of his political platform. In addition to Khaled’s search for refuge, the film is driven by his quest to learn the whereabouts of his sister, Miriam (Niroz Haji), who left Syria with him but was separated along the way. Waldemar helps with the search, but Miriam’s story is left partly unresolved. Of course, so is Khaled’s — and the tales of all the other exiles who inspired The Other Side of Hope. By that logic, no one in Finland more deserves deportation than Aki Kaurismaki.